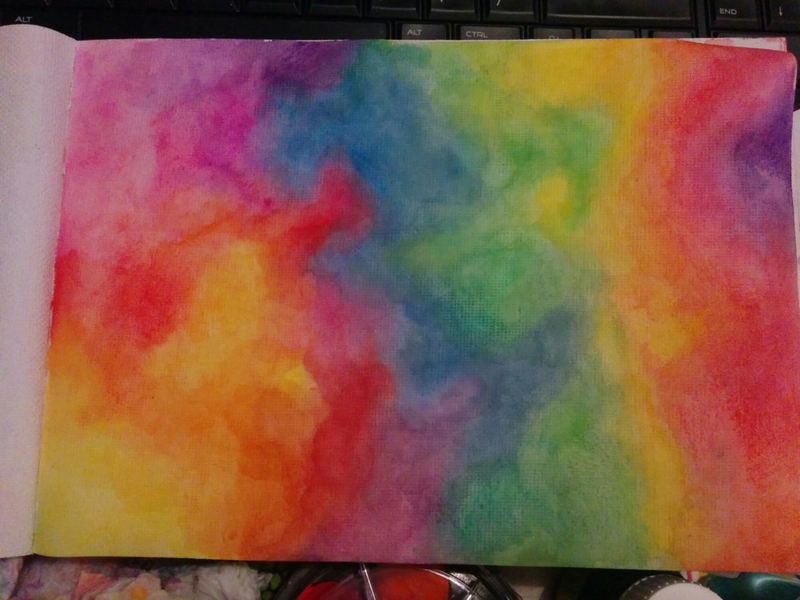 Just a quick update and some pretty swirly rainbow watercolours. Oooh. So, I didn’t win the competition, which I’m fine with. It was a good experience and I leveled up my skills, so it’s all good. I have yet another inspection coming up, so I should really stop playing with the pretty colours, and play with the less messy digital colours. I have something coming in the mail to help this. So excited :). I found a pebble in the garden. So I washed it and painted it. 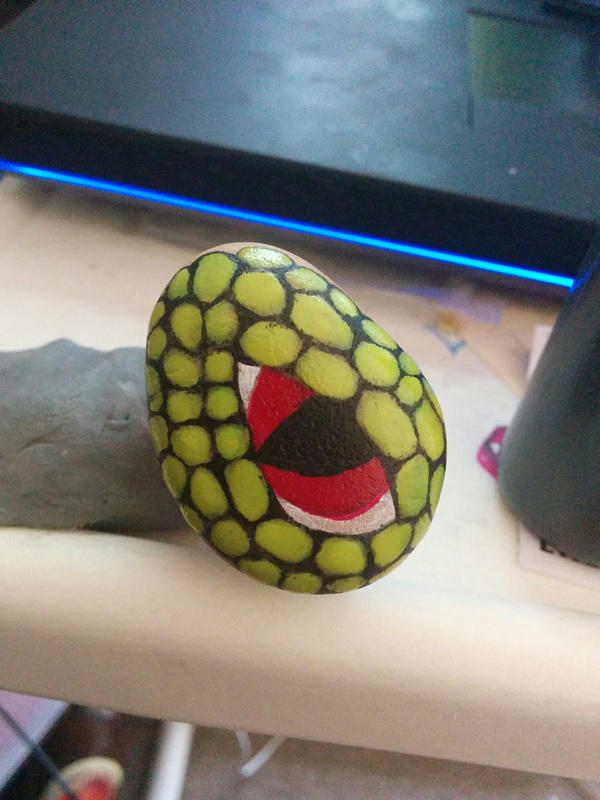 I’ve seen heaps of people who paint dragons eyes on rocks, so I thought I’d try that. I started out using acrylic, but only had three colours in front of me, so I put it to the side while I was trying out nail art on some fake nails. In the middle of this, while waiting for coats to dry, I decided to try using nail polish as the dragons scales. This worked even better than I thought. Building up blobs of the polish gives the piece texture and depth on the scales. As this wasn’t very planned, I added to black for the crevices between the scales afterwards with black acrylic. I found the green polish to be quite opaque and with the amount I put on, it could have easily gone over the top of a black base. Since this picture, I have gone over the red in more polish to make it stand out a bit more, and am planning to put a clear coat over the eye to make it glossy. I think I’ll pick up some nice stones at the hardware store next time I go, and paint some more. They usually sell packets for gardening things. I might show you some nail art one day, but I am so very bad at it, I’m just practising the basics at the moment… Like covering the nail in polish. But not too much. Also patience. Need more patience. Well, here it is. 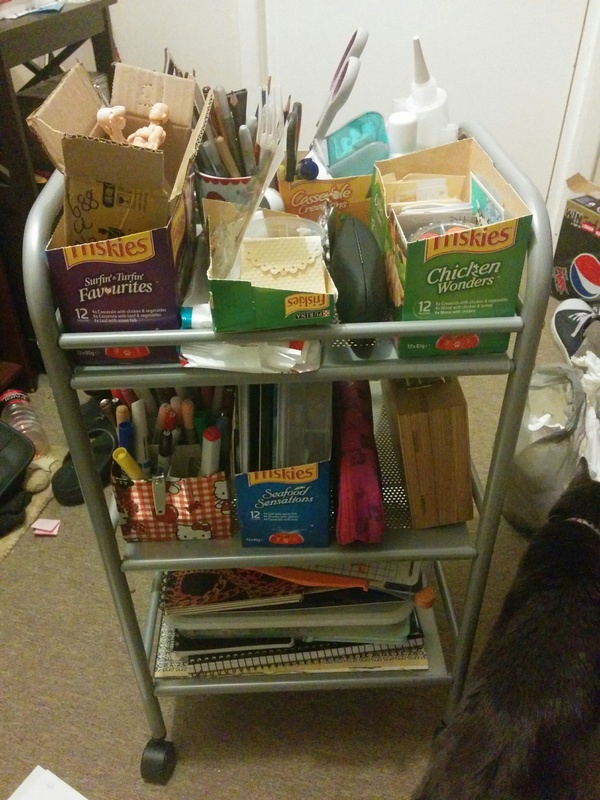 The infamous competition entry, and its work in progress photos. The theme for the competition was a to create a personified season, and put them in a landscape of another season. I chose a girl representing Summer, in the middle of a Norwegian Winter. This had to be done in a traditional medium. This took quite a while, with a lot of work. I wanted to continue, but I was panicking too much, and was advised to stop, to prevent overworking and stressing.I’m quite pleased with it, and it was a great experience, so that’s all I can hope for. I’ll probably not do next months challenge, for a nice break, but I’ll keep an eye on future themes, in case I get motivated to do another one, later. I created this with watercolours, inktense pencils, coloured pencils and acrylic. I had to research quite a few things for this, such as the snow and what children wear in the winter, as I don’t live anywhere near cold. I created a folder full of pictures for reference of winter villages, summer clothing, mountains at night, and bonfire lighting. I had trouble getting the final photo, as the far left always came out slightly blurry, but I think it’ll be alright. It might just be me worrying. The entry is on Newgrounds.com, here, and I think I’ll find out results in the beginning of next month. In celebration of not having to stare at my competition entry today this happened. I was urged to stop working on my painting when my partner found me moping in front of the computer looking up other entries and panicking. This will stop me overworking the picture, and panicking in the last few days, which I can spend on getting the photo right and entering it calmly before it’s due. Unfortunately, my scanner is slightly too small to get the whole picture, and coloured pencil comes out horrible and mottled. I took some photos, which will work. I will post all about it in the next few days, as I need to link to a work-in-progress photo in the entry. 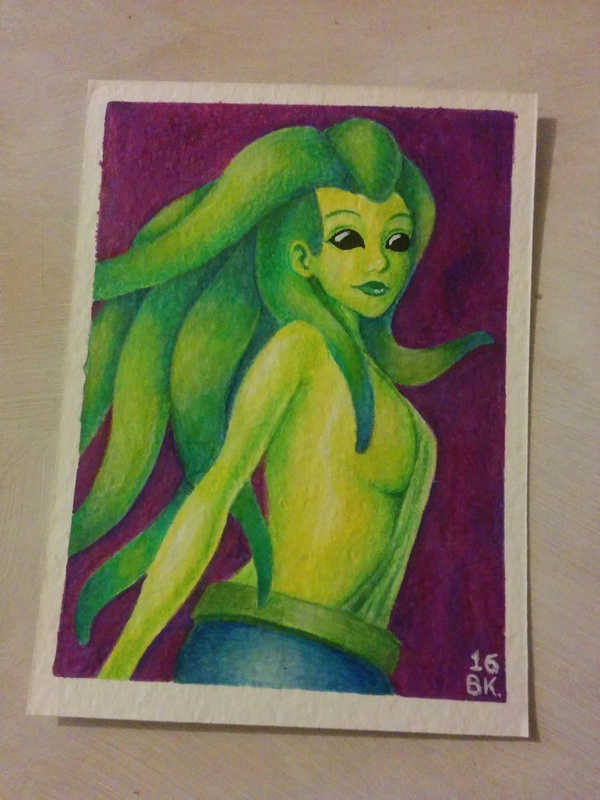 As for the picture I created today, I used a piece of nice watercolour paper, and as I had all my coloured pencils and watercolour pencils out, I decided to use them. 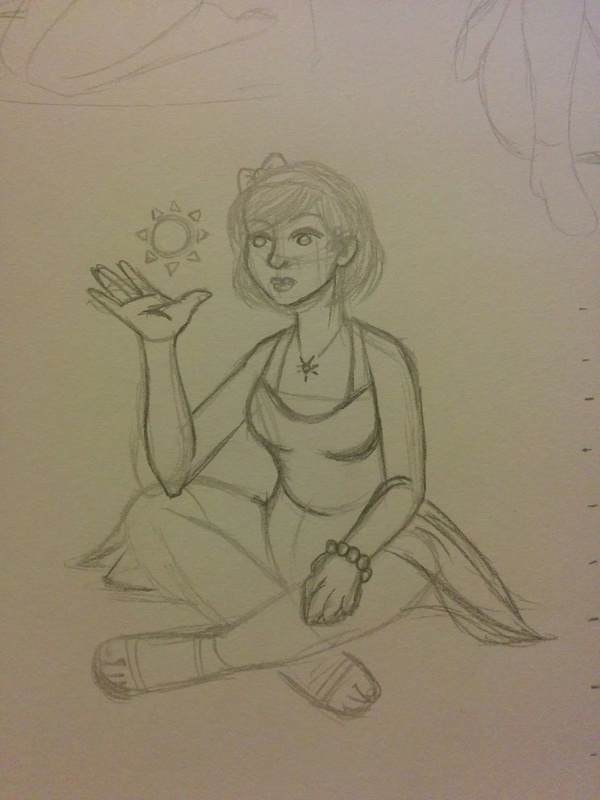 I sketched this out about a month ago when I was having a bad day. My other half has learned that the best way to keep me from turning bad days into curling up and crying is to set me challenges. He’s quite creative in doing this and they can be fun. On this occasion I was in a lot of pain and he decided to pick a card from a box of Magic the Gathering cards at random. This took a few tries, as he kept picking ones with suffering and pain damage, and I didn’t need a reminder of that. Finally he picked out a creature called a “sliver” which are covered in tentacles and spikes and spines. He wanted me to copy the picture on the card, but instead I took it as inspiration to make a glamour model. It kind of reminds me of the baby alien in Men in Black. I’ve been very busy working on my competition entry that I mentioned. I’ve barely even touched other projects. While this is good for focus, I’m beginning to go crazy and worrying whether it’s good enough. However, I decided to give myself a break tonight to save some of my sanity. 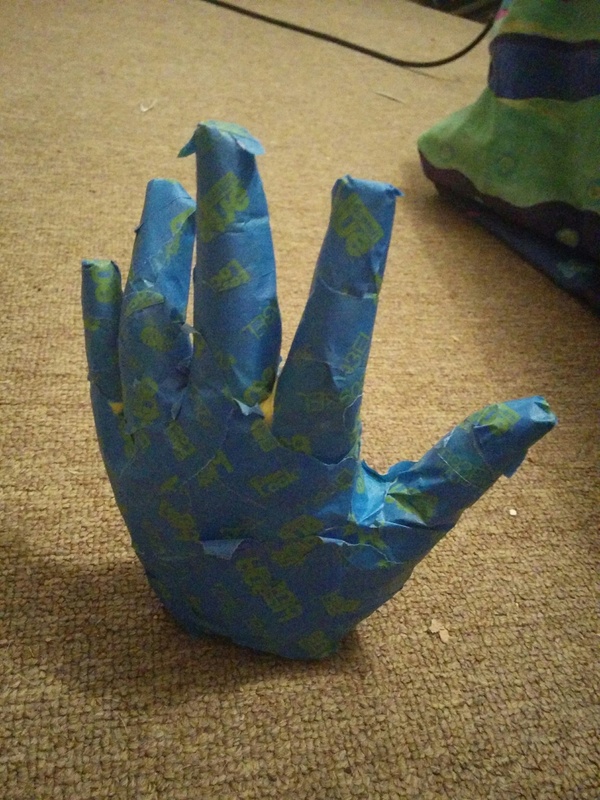 I decided to make my own hand. Easy to do. I got a disposable rubber glove, put it on my non dominant hand, and proceeded to cover with masking tape. When covered, I cut a slit, on the palm, just big enough to wiggle my hand out, then taped the cut back up. I then filled it with tissues and notebook paper before taping the hole up. My next step will be to do a cover of paper mache and I might paint it and put fake nails on. There’s no practical use I have for this. I don’t wear rings for it to be a ring holder. I just needed something quick and easy to do that wasn’t the picture. There is about a week left of the competition time, and I have to finish the picture soon, so I don’t go too crazy. The other day, I stumbled upon a free 3d modelling program in Steam, called Fuse. Steam is usually an application for downloading and keeping a large range of video games in a library on your computer, but occasionally has software that is useful for creating games. Fuse is intended to help you to create a 3D model of a character, so you can export it for using in games and other apps. In Fuse, you can choose from a range of bodies, clothing, hair and accessories, then you can edit them extensively. If you are a member of the Adobe Creative Cloud, you can get a demo of a high definition version on Fuse. One option for Fuse is to export the model to a site called Mixamo. This site gives you a range of poses and animations you can apply to your character. I played around with this for while, and took screenshots of poses to use in drawing. It was good to be able to have reference of something that looked like the characters I was drawing, although the poses and clothes didn’t always match great. Some poses were found in the middle of animations, and had to pause and look through the frames and tweaking the settings. Sometimes the clothes would move strangely, like the skirt was made of cardboard, making sitting poses indecent. I also did some shopping this week, buying some new nibs for my tablet pen, and some little mannequins go help with posing. Playing with ink this morning. Just wanted to pass along a link to a YouTuber that I found, who I think is amazing. He has funny sketches, and awesome art as well as inspirational speeches and tips. I think he should get a load more likes and hopefully we can inspire him to make more videos. You can find him here, at Dino Tomic on YouTube, and he has links to his social media there. Lately, with all the excitement with the shirts and selling, I’ve managed to begin a great big pile of works in progress. This was making me feel a bit overwhelmed and exhausted, but I still wanted to draw. Somehow, my solution involved beginning a new piece of artwork. I was watching YouTube and came across this competition with Draw with Jazza. I thought it might be a good idea to refresh ideas and keep me focused on something with a deadline and do some research and development sketches, working towards a final goal. These steps are often left out of my pieces, as I am too impatient. 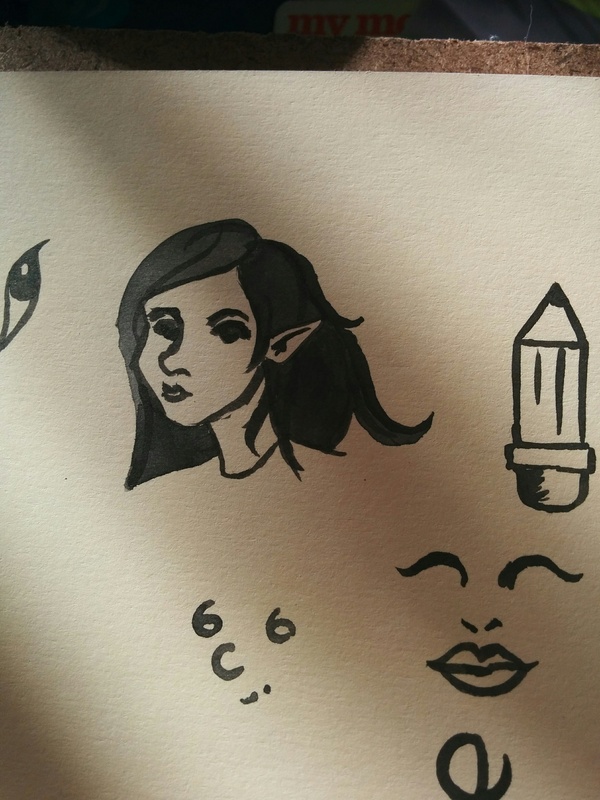 I’d love to get some lovely bristol board or something to do it on, so I can use Copics or watercolour without worrying about too much bleeding or warping. I guess I can have a look at the art shop after pay day.